With a respectable guide number of 50 (at 180mm zoom setting), the Genesis SP692 can fire an intense flash powerful enough to illuminate a subject from a considerable distance. This output can be controlled manually in full, or 1/3 stops, down to just 1/128 power. This makes it suitable for use with wide apertures, or as an effective fill light. 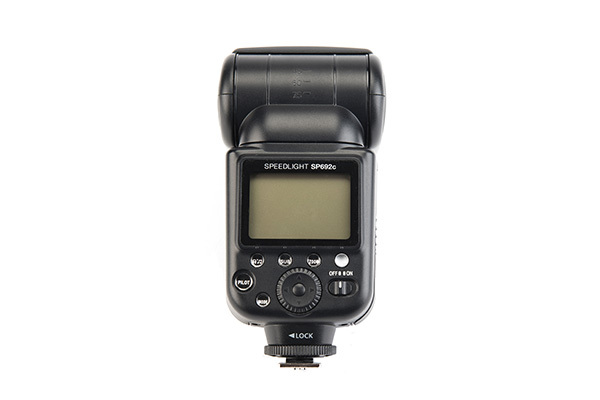 There are also Multi-flash and TTL (with flash compensation) modes available, while the SP692 can be used as either a master or slave in Nikon or Canon’s optical wireless systems. The flashgun’s zoom can be controlled automatically or manually, with the spread of light adjustable for focal lengths from 24-180mm. There’s also a wide panel adapter for shooting subjects at close distances. Fully adjustable, its head can rotate 90° left, 180° right and upwards by 90°. This allows excellent control of flash direction for bounce effects, while there’s also a pull-out bounce card. 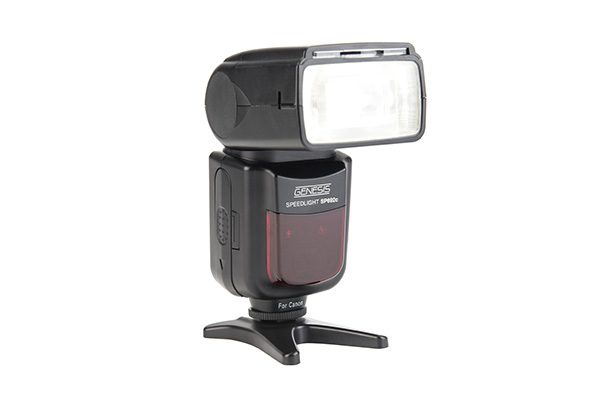 With an illuminated rear LCD, directional pad and multiple buttons, control of the flashgun is comprehensive on-device, though not as intuitive as the simpler system of the Nissin. An AF assist lamp is present, while there are inputs for PC sync and an external power source. Powered by four alkaline AAs, the recycle time is 5 seconds. While the SP692 feels less durable than the first-party offerings and the Nissin, it’s still well built and benefits from a metal hotshoe. A well-priced and fully-featured offering that puts the user in full control of all settings, it’s a shame that operation doesn’t feel as intuitive as some of its rivals.